Aw…what a long week. And the weekend is really busy too. So I am really, REALLY looking forward to Shabbat. I love Shabbat. I have always loved Shabbat. The rest. The focus on family and friends. The food. The relaxed pacing. As a congregational rabbi, I must admit that my Shabbatot (plural for Shabbat) do not always include rest, relaxed pacing, or a focus on my family and friends. I sometimes yearn for a Shabbat that would remove me from my regular Shabbat schedule and plop me down into a Shabbat experience full of possibilities. (d) just curious about how Shabbat can be contextualized in today’s modern world. In other words, this weekend is for everyone!!! There is a tremendous difference between ‘should’ and ‘could’ when you think about it. 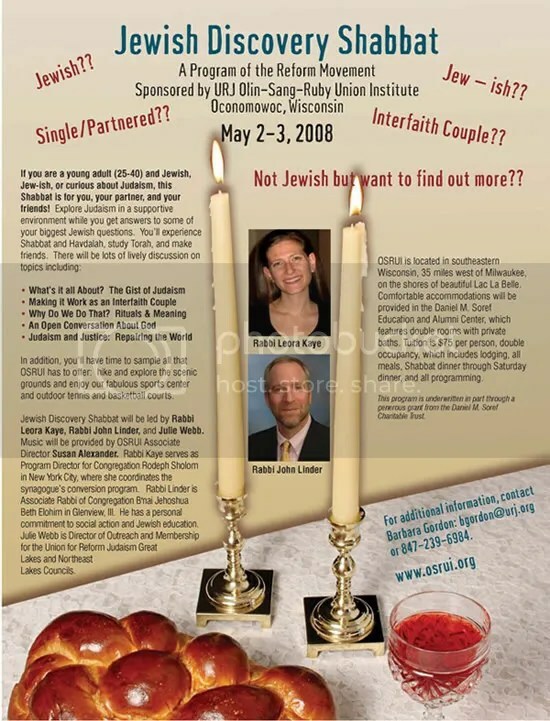 I reckon many people would dismiss this opportunity out-of-hand, fearing the goal is to make them “religious.” [Which is not necessarily a bad thing…] It would be more accurate to view this retreat as an safe environment in which to consider the myriad of ways Shabbat might be observed. Making it meaningful. Deliberate. Relevant. If you have questions about the retreat, you can contact OSRUI (the fun acronym for Olin-Sang-Rui Union Camp!) or psot it here and I will forward it to the appropriate person. You are not going to want to miss this!! !